If there were an online marketplace of vintage Big 4, 5, 6 or 8 swag, I can just imagine the sickos that would troll it all day long for the best deals they could find. 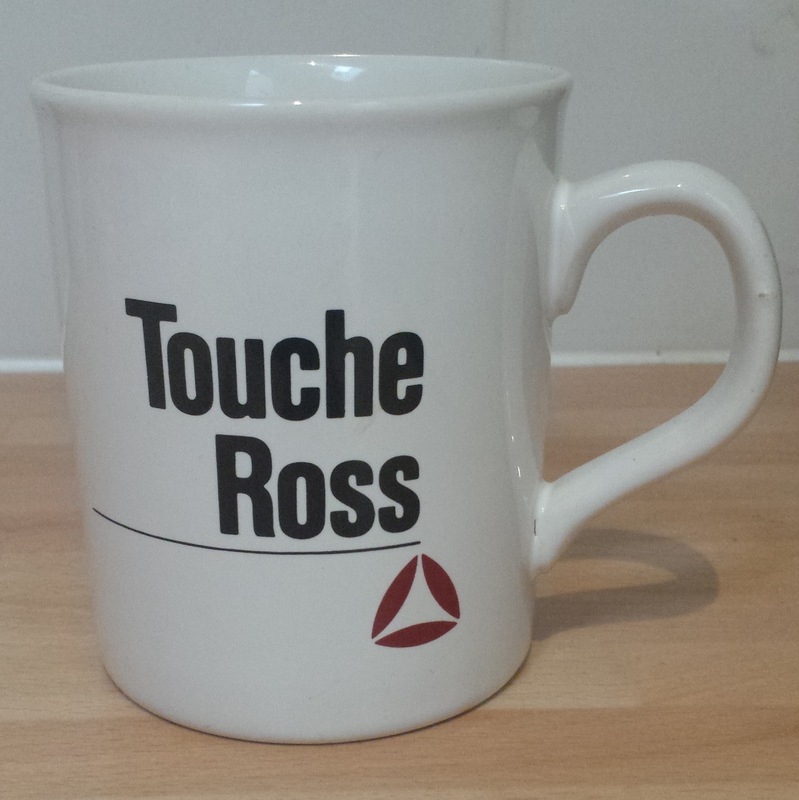 Andersen mousepads for $2; PricewaterhouseCoopers backpacks for $10; Touche Ross coffee cups for $3. I'm sure there are hours of cut Storage Wars footage where they find units loaded with this junk. "Ernst & Young TAS Centers of Excellence" logo. I understand such logo considerably decreases the value of this piece of merchandise and am thus offering it at a substantial discount to reflect that. Please do not make offers above the asking price unless they are serious offers and you can provide proof of funds since the bag with the Ernst & Young TAS Centers of Excellence logo is clearly worth less than such bag without the logo and please do not reply and point out the fact that one would pay more for the bag without the logo, as I totally agree, and again, the price reflects a significant discount to reflect that. Also, please do not reply with questions asking why the leadership of Ernst & Young thought spending money on a bag with an "Ernst & Young TAS Centers of Excellence" monogram was a worthwhile expense rather than compensating their employees with the cash value of such bag or providing such bag without the logo. Perhaps the idea was the brainchild of a married with children principal in the group and a married with children senior manager in the group and this bag was the "spark" that ignited the initial flame and resulted in both individuals divorcing their respective spouses, marrying each other, and combining assets in order to have not one, but TWO monogrammed "Ernst & Young TAS Centers of Excellence" computer bags (one could only hope that the aforementioned hypothetical principal and senior manager were allowed to each keep their respective bags as part of any hypothetical divorce settlement agreement and that the hypothetical senior manager was promoted to partner and was able to accumulate additional bags at competitor accounting firms). Let's stop there to take a breather because WHOA. This is precisely the Big 4 romcom story I've been waiting years for someone to pitch. I'd buy that story for…$5. That sounds like every Big 4 initiative ever proposed. I have absolutely no insight or view as to the rationale behind such an absurd and ridiculous marketing or employee morale ploy, and highly doubt it was effective in generating any business whatsoever or in satisfactorily compensating employees. I also doubt employees in receipt of such bags at the time are still employed there, and if they are, I'm sure they are in a leadership position advocating for the use of funds on more Ernst & Young monogrammed bag merchandise and continuing to waste time and money. While I don't know with any certainty, I further doubt that any engagement with a prospective client was won with a pitch involving such monogrammed bag or a client saying "If I didn't see that Ernst & Young TAS Centers of Excellence bag, I would have never purchased your TAS Centers of Excellence services, which I didn't know anything about, but could only assume the TAS centers are excellent from that bag, and that is why I purchased your services." Okay, it goes on but I'll stop there because I do want to hear a dystopian tale of someone so transfixed by the EY TAS Centers of Excellence services branding that they couldn't help buy EY TAS Centers of Excellence services. I imagine them being led on a Kafkaesque journey to find someone who actually works at EYTASOE, but is unable to find an actual location or learn what their services actually are. It'll end when the protagonist opens a single door to find a lone person behind it monitoring an answering service machine and a mountain of microcassette tapes covered in a thin layer of dust. Additionally, and again while I don't know with any certainty, I further doubt any Ernst & Young employee said "The reason I work at Ernst & Young in the TAS Centers of Excellence group is for the fantastic swag. I'd rather receive a free bag with their brand name on it than any other bag, for which I'd actually have to pay cash money." or "Ernst & Young TAS Centers of Excellence should come out with a bag line. It would make billions and I'd pay actual cash money to wear a bag with that brand logo as opposed to Nike, Coach, Louis Vuitton or any other brand." or "In addition to the laptop and firm issued laptop bag Ernst & Young provided, the Ernst & Young TAS Centers of Excellence provided me with another bag that I can use for the exact same purpose. I could really use another bag, and if not, I will gift it to my friends and family since they would love an Ernst & Young TAS Centers of Excellence computer bag. Thank you Ernst & Young TAS Centers of Excellence for doing my Christmas shopping for me. You truly are a center of excellence!" or "I had to pay money for my [insert brand name of a bag a person would pay money for] bag and what I really wanted was a free Ernst & Young TAS Centers of Excellence bag." or "I cannot believe Ernst & Young TAS Centers of Excellence would give away this bag to employees for free. The Ernst & Young TAS Centers of Excellence monogram is highly marketable and will increase the value of this bag exponentially and allow me to sell it with ease. I'll take all the Ernst & Young TAS Centers of Excellence bags I can find and sell them." or "I was in the Ernst & Young TAS Center of Inferiority. Fortunately, I was able to improve and move my way up to the Ernst & Young TAS Center of Excellence. My hard work and determination paid off and as a reward I was able to get this bag. I wouldn't let go of it for anything less than $5." or "Do you know whats cooler than $5? An Ernst & Young TAS Centers of Excellence bag." or "Do you know what comes between me and my Ernst & Young TAS Centers of Excellence computer bag? Nothing." Okay, it's essentially done now. I've emailed the seller to see if it's still available. Keep your fingers crossed.